Easily grown in slightly acidic, organically rich, consistently moist, well-drained soils in part shade to full shade. Winter hardy to USDA Zone 10. Intolerant of freezing temperatures. 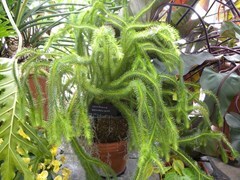 Lycopodium squarrosum, commonly known as rock tassel fern, is an evergreen, non-flowering, epiphytic fern ally. Although classified as a fern, it is in fact not a true fern. It is a member of the club moss family. It reproduces by spores, with sporangia found on its cones or leaf axils. It is native to tropical parts of Africa, Polynesia, Australia and Asia where it is often found drooping from rain forest tree limbs to form curtains of green fern-like foliage. Slender mature stems droop to an impressive 3-8’ long clad with small needle-like leaves (each to 1/2”long). Tassel-like appendages form at the ends of the stems/branches. Genus name comes from the Greek words lykos meaning wolf and podion meaning foot in reference to some purported resemblance to a wolf’s foot. Specific epithet from Latin means with parts spreading or recurved at the ends in reference to the tassel-like appendages. Common name is in reference to the tassel like appendages. Mature plants are amazing specimens. Excellent plant for hanging baskets. Where not winter hardy, plants are best grown in a conservatory or greenhouse.